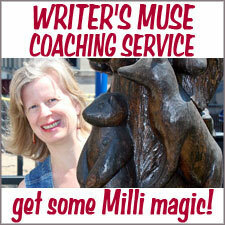 By guest blogger Cathie Nichols. Photos Copyright © Cathie Nichols. BEING AN EAST COAST (outside Philadelphia, Pennsylvania) transplant living on the West Coast (Carlsbad, California) can be a real bummer during the Christmas holiday season. White sandy beaches are definitely not the same as a sea of sparkling white snow. Making angels in the sand is messy and requires several showers just to get the beach out of one’s hair. Snow, on the other hand, is clean, quiet, and soft. What I miss most about the east during the holidays are the lights reflecting on the snow at night. 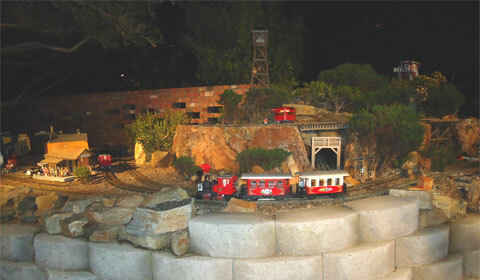 I used to walk alone around my neighborhood and check out the displays. 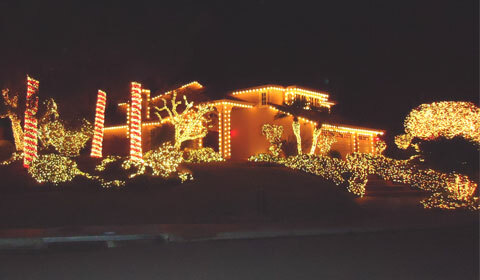 Many people went overboard when it came to highlighting their homes with animated deer, strings of lights that make you wonder how they got them all the way up there, and music to accompany the twinkling. Walking around my suburban San Diego neighborhood in the “frigid” 57-degree air is just not the same as shuffling through a couple inches of powder with each step more muffled than the last. My neighbors’ homes are typically laden with white (or blue) fake icicles, which only irritates me more. Why aren’t there suns, flamingos, and palm trees on a string? I suggest everyone stop trying to look like a winter wonderland and embrace our tropical climate! My kids did not grow up in an area where snow was the norm. I think I’ve done them a disservice by not dragging them somewhere freezing cold at Christmas so they could experience the magic of seeing holiday lights reflecting on snow. They do not know the magic of turning a snowball into a snowman. They never experienced the mountains that the snow plows make, or missed a day of school because of snow. Every child should have at least one snow day in his or her lifetime. So what is an East Coast “girl” (ahem) to do? Each year I get my holiday spirit from visiting local San Diego attractions that get all gussied up for the holidays. The more ridiculous the decorations, the more likely I am to be there. Hokey? Heck yeah, count me in! 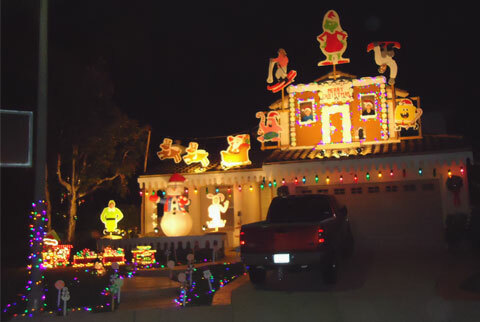 For example, the Del Mar Holiday of Lights show, which I attend every year to the dismay of my family. While I’m oohing and ahhing over the somewhat old-fashioned light displays, my kids are groaning and providing excessive eye-rolling. I make them go every year. It’s as if seeing the lights gives me the power to keep shopping for Christmas gifts in shorts and flip-flops. 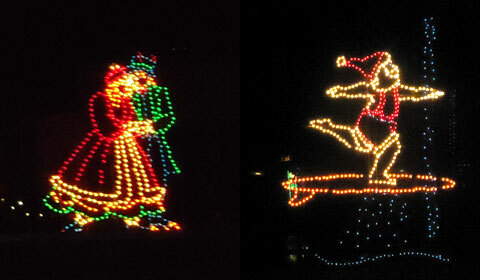 Left: Lovers on ice skates | Right: Surf's up, Santa! The Del Mar Holiday of Lights show is an extremely popular event in San Diego and is well attended. If you decide to go the weekend before Christmas (like I did), expect to wait an hour in line before you even get inside the track. (Sigh.) The show opens its season on Thanksgiving Day and ends this year on New Year’s Day, so if you want to be one of the first (or the last) to see over 400 lighted displays, I suggest going then. The light show is one in which the participants drive around a horse racetrack in one’s own vehicle to look at the lights, so if your little one doesn’t do well trapped in his car seat for an hour, get to the show when it opens at 5:30 p.m. According to one of the direction pointers in the parking lot, there are fewer people waiting to get inside near the dinner hour. Another annoying exercise I put my kids through is driving around the area in search of homes with incredible light displays. Usually what I do is bake sugar cookies and then, while they’re cooling, we take a ride in the family minivan. The minivan is now thirteen years old and stinks from so many different spills over the years, so I try to keep the kids’ sensitivities in mind and make the trip short. A gingerbread tract home. Yum! The cookies are integral to this evil mom plan because I let the girls know upfront that they can frost, decorate, and eat the cookies after we get home if they keep their impatience to themselves. This threat usually works, especially after the first sign of their annoyance—I simply raise my eyebrows while pursing my lips. Sure, we have to drink the hot cocoa with the sliding glass door open, but it’s the tradition that counts. 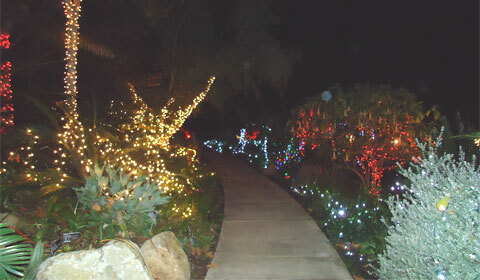 One final activity that gets me in the mood for Christmas in this tropical climate is to visit the San Diego Botanic Gardens in Encinitas. It’s a time for me to spend alone looking at the lights without the kids begging to go home. There’s nothing that will break the spell as quickly as a child complaining about how much her feet hurt! The plants at the San Diego Botanic Garden are like beautiful artwork during the day but, lit up, they’re magical. Even though while I’m at the gardens I am not making progress on my ever-increasing Christmas list, I feel I need the time to get the same calm and peace I used to feel from walking around in the first snow of the season in the East. Because the trails are so peaceful, it is a quiet time to reflect on the true spirit of the season. Although there’s nothing that will ever replace my memories of the snow and the Christmas lights of the East Coast, I have found other ways in which to get into the holiday spirit . . . while walking around in flip-flops and sweating in my hat, scarf and mittens. Cathie Nichols (aka @Bloggoneit) is an author-in-training and is in the process of writing a book on a topic she knows very little about. Sometimes overwhelmed with three kids, a husband, a dog, a cat, and a couple jobs, she finds her sanity by escaping life through a super sappy movie or venting in a blog post at Bloggoneit. I’ve had many Christmases away from snow and cold, and there is something quite odd about lights and Christmas tunes with palm trees around, and poor Santa sweating in a suit. Here’s hoping you have a cool enough day to enjoy roasting a turkey and sipping hot toddies without sweltering too badly! Thank you! Yes, I also hope every year that we don’t have the dreaded Santa Anas which makes the daytime very warm. The night is extremely cold and that’s okay but it’s the daytime where I’m cooking (and sweating). I’ve been blessed to have grown up in Southern California so I’m used to these “warm” (well, we still think it’s cold) Christmas traditions. I was pretty excited this year when my husband (who is from St. Louis) shared that he thinks there’s something pretty neat about palm trees wrapped in Christmas lights. You take what you can get, I suppose. Having experienced a couple years with a white Christmas in St. Louis, I will concede that Christmas lights twinkling in snow are fantastic…and beat a Chistmas light adorned Palm Tree anytime! I know what you mean about “Well, we still think it’s cold” because when I take my dog, Pearl, out for a walk, I’m in a parka. Sure, it may be 52 degrees but I act as if I’m in Siberia! My daughter just played with packing peanuts as if they were snow so I know I’ve definitely deprived them of a major experience! It *is* hard to complain about the weather here — I definitely do not miss the humidity!! Great article! I live in San Diego and these are some new ideas for me. Thank you! Glad I provided you with new ways in which to enjoy San Diego. Definitely go check out San Diego Botanic Gardens especially since they have snow (call them first to make sure some is still there). The girls had a great time this year roasting marshmallows and drinking hot cocoa while looking at the colorful light displays. They also have a Santa available for pictures, and a hay ride. Note: Bring CASH as they don’t appear to take too many credit cards. Pictures with Santa are $3 and the hayride is also $3 per person. Thank you for your comments, Mo. I think you’re right. I continually find ways to “deal” with the weather here in San Diego at the holidays, and it sounds like you have, too! I used to live in San Diego – so I know the places you’re talking about! However, I moved from one warm clime to another….I now live in Florida! I LOVE the warm weather and would not be happy with a cold Christmas. I guess it’s just a matter of what you’re used to. 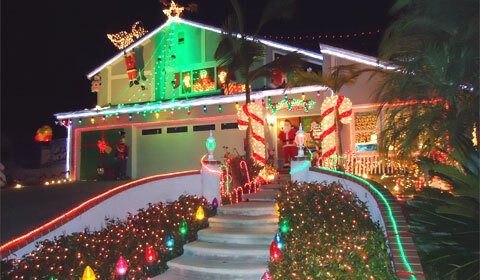 We are very much alike when it comes to light displays! My mother used to say if you’re going to be tacky – be GLORIOUSLY tacky! I honestly like a little bit of cheese at Christmas time! I am in total agreement with your mom, Ann. 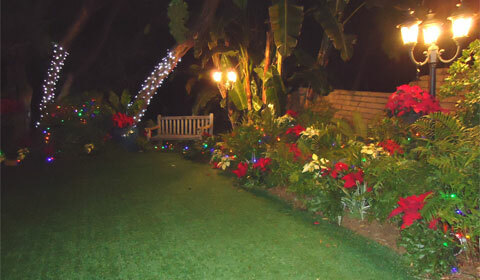 I went over the top with my own home this year, and there are no white lights at this house — only color and more color. Oh, wait, I do have those bobble headed deer, so I guess those are my one nod toward classiness. Many San Diegans move to Florida. I have a friend who moved there in July and another who will be there soon. I’ll send them your way!! Cathie, Thank You for bringing a west coast Christmas to the rest of us! I’m like you, I like snow and cold around Christmastime. We are having unseasonably warm weather here in South Carolina. The lights here just don’t seem right because it is so warm. Photos are great! 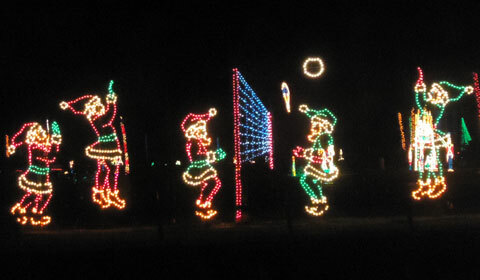 I like the elves playing volleyball on the beach, the secret garden and Wow that is one over the top house in La Costa! Nice caption. Thank you for your comments and I’m sorry you’re in the same boat. In fact, it’s supposed to be 72 degrees here or so on Christmas Day. Sigh. It’s just not the same. On that one house in La Costa, I was going to make the caption “InSantaty” because there were so many Santas on the property but I’m not sure the picture captures all of them. I am on the east coast and Christmas is the one time of the winter I want snow.. If I could have my way I’d have snow a few days before Christmas, then melt away a few days after. The San Diego Botanic Gardens is a lovely place. I have visited there. I bet its more so at Christmas time! Great photos, and fun article. Thanks! I wish for the same thing here: snow falling in California for a few days before Christmas and then melting soon after. That wish has a snowballs chance of happening, though, especially now that we’re right smack in the middle of a Santa Ana which means very warm days (70’s yesterday) and freezing cold nights. Enjoy your weekend, and thank you for the comments. I love these beautiful holiday traditions you’ve created for you and your family… and thanks for including that each moment is not all perfect and rosey like it is for television families so I can feel better about the crazy that ensued as we piled into the car to go check out holiday lights in our neighborhood this evening! I think that’s why I love the show “Modern Family” so much because it presents a family (warts and all)to the viewers. Even though the family is not perfect and events frequently go wrong, they all still love each other and make the most out of the situation. I can almost always see the silver lining in most activities that go more Modern Family and less Brady Bunch. I admit it’s much easier to deal with some of the things that went wrong on our outings with electronic devices. In the car for the Holiday of Lights show, I had 3 college teens, 1 almost teen and 2 preteens. Each had their own gadget which was heavily utilized. And when one of the girl’s cell phones went kaput due to a dead battery, the other two girls shared their phone. Now *that’* the Christmas spirit for ya! Even though we do get snow here, it’s less and less each year. We didn’t even have a white Christmas this year. I went for a drive on Tuesday just to see some snow! We drove around Cold Mountain through the Apuseni Natural Park all the way to Belis Lake. It turned into a small trip, and the fog didn’t help in certain places, being on a road which appears on no map… but the view was amazing everywhere we drove by! Plus we dd find snow there – sooo pretty! Funny that we’re in two different spots, and yet we both have to drive to see snow. The only problem is that snow is such a rarity where I am that 3 million San Diegans take the day off to drive to it when it does finally snow. Needless to say, it looks white and pristine for about a minute. After writing this article, I decided that next year, my family and I are going somewhere snowy for Christmas, or at least if it isn’t going to snow, then I want to see pine trees instead of palms. I think today is going to be somewhere around 76 degrees with the wind chill making it feel like 70. Nothing like wearing shorts on New Years and showing off my snowy white legs! So cool Cathie (no pun intended, I swear). Here in the South of England we tend to be stuck in between the weather extremes you have. It’s chilly but rarely snows at Christmas, that tends to come towards the end of January if it comes at all. I’m immensely curious to see what Christmas in a hotter climate is like, it seems like a total contradiction in terms, hopefully I’ll get to try it soon in NZ. We definitely know how to make up for a lack of snow here! One house I saw the other night actually made me believe it had icicles hanging from its two roof lines. They did such a nice job that one can really believe it’s freezing cold, but alas, while I walk my dog in a sweatshirt, I’m sweating, so although I may be deceived, it’s truly for only a split second. I would love to come to the South of England — maybe we can switch places next year! Happy New Year to you, too. Hope it is great for you!! Neat article, but SD doesn’t have a tropical climate. It has a Mediterranean climate. But good article. I used to live in DC and I understand how you feel. Now I’m in Oceanside. Thank you for reading my post, and you’re right — it is a Mediterranean climate here in San Diego. No matter what type it is, though, I still miss the first snow and last snow of the East Coast, and the twinkling of the lights in the snow. Hopefully I will get my fill of the East Coast next year when I finally make the trek back. I still won’t get to see the snow, but I know I will get enough humidity to keep PA off my mind for years to come! My recent trip to Turkey and Greece reminded me of how much I dislike humidity!! 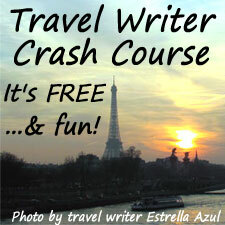 Do you head back to DC in the winter? I lived in SD before, and moved to DC in summer 2008. I just moved back last summer. I haven’t been back to DC since then, sadly, but I am hoping to return in the fall. I really love spring and fall the most. Spring’s flowers (cherry blossoms) were beyond beautiful, and the falling leaves were gorgeous. I also love the look of when snow gathers on the bare branches of the trees. I used to love the fall, too! There is nothing like the smell of leaves. Gosh, there are days I just miss it so much. I never got to see the cherry blossoms in bloom but I can only imagine how beautiful it is. I only recall the forsythias and the azaleas where I grew up (the Main Line outside of Philly). I have had an azalea bush here in CA but it didn’t really create the same spectacle. Well, we’re here now — time to embrace the palm trees!! Yes, I used to have azaleas outside my old house too. I miss those, and the magnolias. You should go to the Cherry Blossom Festival in DC sometime. It’s great. I’m glad you enjoyed my post! I just reread what I wrote and realize it’s time to start thinking again about “Christmess.” I put in mess because I will have to drag so much junk out of my garage to make this Mediterranean climate festive. Dreading it already. 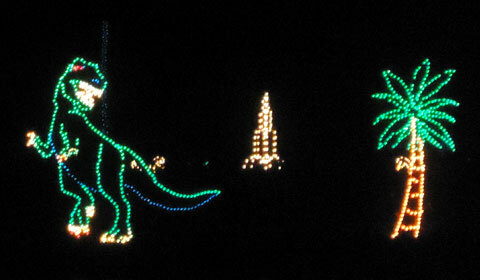 This year, for sure, I will drag the kids to the Holiday of Lights show the Monday following the Thanksgiving break. I will never again wait as long as I did last time — it was torment for all of us to sit in the car for over an hour. I think my behind is still sore from that!! Happy snow hunting to you and your grandchildren!